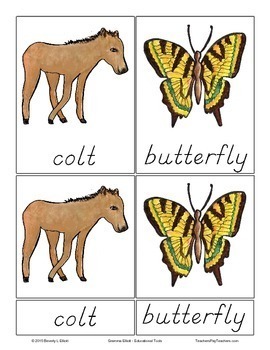 "Three part cards" are used for matching and learning words. Cards of this kind provide several levels of word learning based on readiness. Cards are cut so that there is a card with 1) only a picture, 2) only a word, and 3) a card with the word and picture. Students can use the cards on a Montessori board or box so that students match all three cards independently or with the help of a partner or tutor. Eventually matching the plain word card with the card with only the picture can lead a student to word mastery. Students may copy the words on to paper, a white board, or in a thin layer of sand or playdough. A tutor or homeschool parent can set out several cards and ask students to find certain cards with or without the pictures. An extra set can be printed so that the word cards can be glued to the back or picture cards to make flash cards to put on book rings for students to practice independently. In other words "three part cards" can be used in many ways to help students expand their reading, writing, and speaking vocabulay. Three part cards are part of a Montessori education, but can be used by all teachers and students. For a BUNDLE of 3 Part Cards in Spanish and English Click this link. 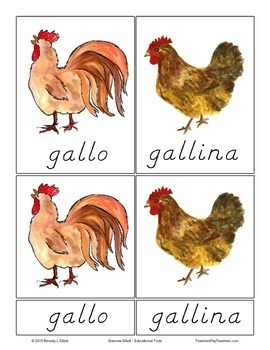 Click here to see all my Spanish and Dual Language 3 part cards. 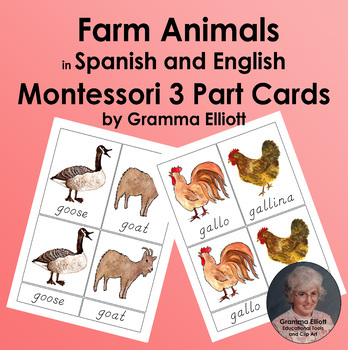 Montessori Three Part Cards in ENGLISH ONLY. 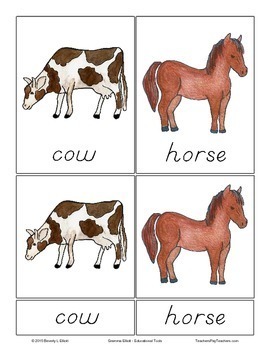 For a BUNDLE of Montessori Three Part Cards in ENGLISH ONLY (including this product). Print each of the 24 pages on card stock, and cut them along the black lines. Laminate or not. Use them for so many purposes: matching, studying, copying, in centers, for tutoring, bulletin board, and more. I hope your students enjoy learning with these tools. Thanks for your interest in my products. I hope you will come back for more as I continue to add similar products to my store.